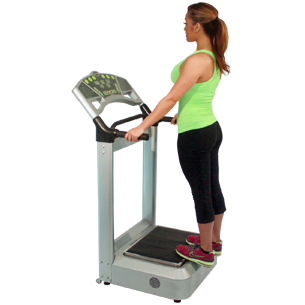 Stand on the vibration plate with both feet half way on the front edge of the plate with toes facing forward. With legs slightly bent, push the heels down and you should feel tension in your calves. To vary this exercise, keep your back straight and push your pelvis forward. You should feel tension in your calves.